The Epson OmniLink TM-H6000IV-DT has been discontinued. No direct replacement is available. The high-performance OmniLink TM-H6000IV-DT combines Epson's best-selling multifunction printer with a retail-hardened PC to deliver mobile, portable and full-featured POS solutions that meet the needs of today's retailers. Epson's OmniLink TM-H6000IV-DT supports mobile POS across multiple platforms, devices and applications anywhere in the store. And with its built-in web server and ePOS technology, it offers web-based printing and peripheral control from any mobile device. 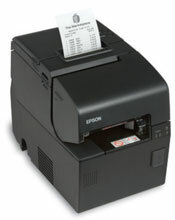 Intelligent Receipt Printer, Direct thermal, MICR, 1.86GHz processor. Color: Black. Includes power supply, and USB cable.